Want to watch razor sharp on all your YouTube videos, that is only if you enable the YouTube HD feature (720p or 1080p High definition video). But the problems these days is that YouTube choose self the highest quality. This is now history with the Turn Off the Lights extension installed on your favorite browser, because you have the ability to get automatic the highest resolution of the YouTube video. The extension provides you the ability to watch videos in Full HD or even in Ultra HD (4K) automatically. Even if the maximum resolution is only 720p. Turn Off the Lights will automatically detect the highest resolution of that video clip, and force the video player to plays that highest quality. Example: If the YouTube highest quality is 4K, and can't YouTube force 4K itself. The browser extension will force this video player to play the 4K video quality on your browser. When you enable this YouTube AutoHD feature in the Turn Off the Lights options page, it will plays automatic the YouTube video on the highest selected quality. You as user can choose between a wide range of qualities: default, 144p, 240p, 360p, 480p, 720p, 1080p, 1440p, 2160p (4K), 2880p (5K), 4320p (8K) or highres . Where the "highres" is the highest resulution of that YouTube video content. For users who install this browser extension for this first time is the "AutoHD" feature is default disable, but you can easily enable this feature in the Turn Off the Lights options page. And it's suitable for both Adobe Flash and the HTML5 video player on YouTube website. Since YouTube enabled the new frame rate for his YouTube uploaders, now you can see options 1080p60 or 720p60 in the quality menu. When one of the options is active it plays the 1080p or 720p in a 60fps in your Google Chrome or other browsers. Turn Off the Lights supports this new 60 fps frame rate, and will automatically use the highest frame in that YouTube video without changing it manually. That's great for watching YouTube videos without shocks. Example on a YouTube game video as this Donkey Kong Country: Tropical Freeze 3-4 Time Attack. How enable the YouTube AutoHD 4K Feature? The steps to enable this AutoHD feature in Turn Off the Lights is very easy. Just go to my Turn Off the Lights options page, by example click right on my lamp icon in the workbar and then select "Options". Or in the extension overview page, click there on the button "Options". When the Turn Off the Lights options page is finished with loading, scroll down to the bottom of the page. And enable the checkbox "Automatically set the quality of YouTube videos". Below that, you see an option to select self the preferred YouTube quality. Where you can choose to force the YouTube player to plays a high resolution video (4K) or even the lowest quality (144p). Technically, "Ultra High Definition" is actually a derivation of the 4K digital cinema standard. However while your local multiplex shows images in native 4096 x 2160 4K resolution, the new Ultra HD consumer format has a slightly lower resolution of 3840 X 2160. 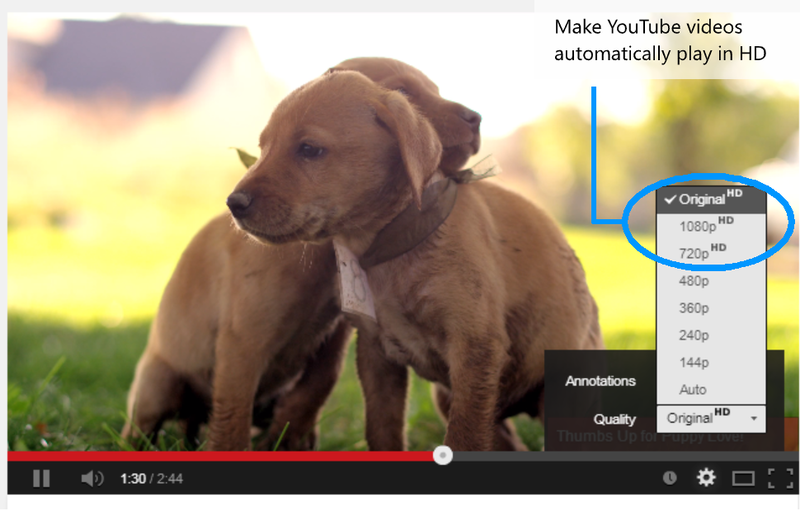 When you are watching a YouTube video in 4K you see all the details, even the smallest. And when you use the Vivid Mode feature, this combines a great and amazing movie experience online. While today in the stores you can already buy Ultra HD 4K and 5K tv monitors such as in the Best Buy, Walmart or Fnac store. Thanks to this Youtube HD extension you get the best video quality on your screen. This autohd feature is a great option force YouTube to automatically play videos in higher quality resolution by default. And you mustn't click anymore on the quality button in the YouTube video player. If you haven't downloaded this amazing Turn Off the Lights browser extension, you can download it for Google Chrome, Safari, Firefox, Opera, Maxthon, Yandex and Microsoft Edge. Turn Off the Lights was designed to make the experience of using web and video lovers more pleasant, more colorful, and even more fun.